Value can make or break a quilt. The right value can make a quilt shine and the wrong values will make the quilt look flat. It is one of the most important parts of selecting fabrics. You may be asking yourself, "I know it's important, but what is value?" Value is the lightness and darkness of a fabric, not how much you paid for it at the store! Many quilters are afraid of value. They don't know whether a fabric is light, medium or dark. It may seem confusing, but it does not have to be. There are a few tricks and tips that can help you determine the value of a fabric. Remember; the value of the fabric is the lightness or the darkness of that fabric. Many times the value of the fabric is relative to its neighboring fabrics. This demonstration may help you understand how value is determined. When this fabric is viewed alone, it looks light. However, when lighter fabrics are placed next to it, it looks darker. The medium fabric now appears darker. When very dark fabrics are laid next to it. The fabric looks lighter again. lighter when darker fabrics are laid next to it. You can see how a fabric's neighbors can influence its value. by a light fabric and a dark fabric. Some fabrics will always be a light or a dark. These off-white fabrics are light no matter what fabric surrounds them. Examples of light value fabrics. These dark fabrics are dark no matter what fabrics surround them. Examples of dark value fabrics. As you can see, the value of a fabric depends on the fabric that surrounds it and it's own lightness or darkness. There is a tool that is helpful in determining the value of a fabric. A value finder is a tool that takes away the color of the fabric and shows the lightness or darkness of a fabric. It is as if the fabric was photocopied and the color was removed. The red value tool will work on all colors of fabric, except red. 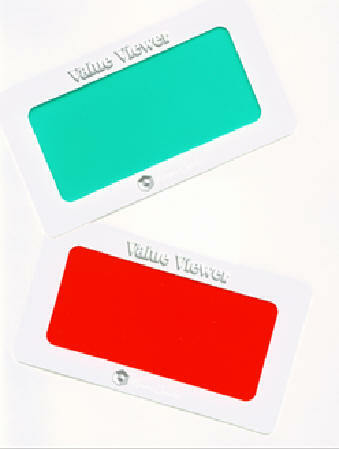 When you are determining the value of red fabrics, use the green value tool. The green value tool will work on all colors of fabric, except green. When you are determining the value of green fabrics, use the red value tool. Consequently, you will need both the red and the green value finders as you work with different fabrics. If you have a multi-colored fabric, overlap the tools and use them together. When placed together, they create a brownish color and this will work on almost every color of fabric. You may find using both tools together a bit dark, but you will still be able to see through them. To use the value tool: Select several fabrics whose values puzzle you. Place them next to each other or slightly overlap them. Put the tool up to your eyes and look through the tool. The fabric should appear light or dark, almost black or white. You can now tell if the fabric's value is light or dark. Some quilters have trouble using a value tool; usually when this happens, they are not using it correctly. They are laying the value finder on the fabric instead of putting it up to their eyes. To work correctly, the tool must be put up to your eyes and looked through. If, in the past, you have trouble with value finders, give this a try. After learning how and why to use a value tool, it will become a very important part of your quilting tools. It is invaluable in distinguishing a fabric’s value.